Now that's the statement of the year. 20mph will bring speed reductions!!!!! As Grey man said, it won't stop those who ignore any speed limit. At the end of the day, it will depend on what stats are taken and comparing like for like, though I doubt that will happen as those for, will want conclusive results without any room for doubt. Rod. You still haven't answered any of those questions in spite of the fact that you say there has been extensive piloting of the schemes. Just some numbers and projections would prove your point. In York, they are already trying to reverse the policy because it is quite clearly ineffective. I don't object to travelling slower. That's you making stuff up to try to create a straw man. And I don't have any problem with cyclists other than wishing that some of them and some other road users would remember their obligations to everybody else. And in fact I use a bike myself. The fact that you are unable to give any hard data and then try to brush off the uncomfortable facts from other towns along with the fact the police are at best neutral on the subject does however confirm my opinion that this is not about road safety, but about social engineering. Of course you could just disprove my opinion by answering those questions. Then I'd have no choice but to change my point of view. Until then I'll continue to believe that you are using the safety and environmental arguments to cover up for the fact that what you really want is to be able to control how people behave because you know what's best. So if you could just answer those questions based on the intensive pilot schemes and research, that would be an end to it. This really is becoming a joke. You have already referred to the report on the pilots several times. Hence you have access to all the questions you pose. You keep coming back to York and now that it has been pointed out that any change in casualties cannot be because of their 20mph limits because they haven't yet been rolled them out. You say the "they" are trying to reverse the policy yet York City Council is implementing the policy. We have had many exchanges on other websites and you have never ever changed your view, so I doubt whether there is any chance of that happenning in the future. This is not about what I want, but what the people of Warrington want and every survey conducted that I am aware of, (Bristol, York, Oxford, Portsmouth, Warrington) all come out in favour of 20mph limits being right for residential streets. As does countless other organisations including DfT, NICE, ADPH. And this is about far more than just road safety, and is about creating an environment where we share roads equitably between all road users in a way that all road users benefit. That means more people feel able to walk, cycle and talk in the streets. I am sorry that you simply "don't get it". But that is your problem and not mine. So no numbers then Rod? As usual. I actually know the results of the pilots and they are inconclusive which is one reason why the police are not interested in your scheme and is one reason why you will never quote them. And why you think the results of similar schemes elsewhere can be brushed off with one of your airy 'yeah but, no but' arguments. So in fact I do get it which is why I hold my opinion that this has nothing to do with road safety. What I also understand is that this is a complete waste of money. It won't achieve anything because it has no objectives other than to satisfy your anti-car ideals. If it did, you'd tell everybody what reductions in accidents you expect the scheme to achieve. So your arguments about road safety and the environment are there solely to present more acceptable aims for this than your actual aim. The idiots in cars who cause the worst problems will ignore these speed limits just as they do the 30mph. Those are the people that should be targeted - along with their equivalent on bikes - not the majority of road users of all types who behave in a careful and considerate manner. This scheme does not deal with the underlying issue which is why it is doomed to fail. However, now that it has happened I don't even want it reversed because the council should be able to invest its time and money in more productive issues. It's just a shame that this almost certainly ineffective scheme was ever considered in the first place. For a fraction of the cost of this folly we could have maintained the existing school bus service and diverted other resources into a rather more intelligent solution to the problem of shared road use. - there was a reduction in overall speed to begin with, then it crept back up to the 24mph level that you typically find in these places and which the DFT see as a prerequisite. The DFT has also made it clear that the 20mph speed limit has no effect on traffic speeds without other measures. - there was a reduction in collisions but there was also a large displacement of traffic in the pilot areas. It created rat runs, in other words. - although there were a reduced number of collisions in the pilot areas, none were fatal and the number of serious casualties fell in one area, remained the same in another and increased in the town centre. So overall, it made no difference. Analysis of vehicle speed data has shown slight increases in the final stage of monitoring during the pilot study. This raises concerns that significant positive results may not be sustainable. There is a risk of committing to introducing additional 20mph schemes using limited capital resources with little confidence in the potential of delivering benefits. The making of pilot 20 mph speed limits into permanent Traffic Regulation Orders to enable further analysis may prove sensitive and may be difficult to remove in the future should additional study determine that the speed limits have been ineffective. This policy has already been decided some 2 years ago by the council and is now being implemented. To date you have not been receptive to anything I have said. Incorrect. The DfT references where ave speed drop by 7mph on roads where the previous speed was above 24mph when a town wide 20mph limit was implemented. That's not what the report says and that is not the conclusion from many other reports. That is not the view of councillors and officers. 20mph is as enforceable as any other speed limit. No, that's not what they say in their latest advice on setting speed limits. The DfT references where have speed drop by 7mph on roads where the previous speed was above 24mph when a town wide 20mph limit was implemented. Portsmouth seem to have been used as the test area and starting block for all this. 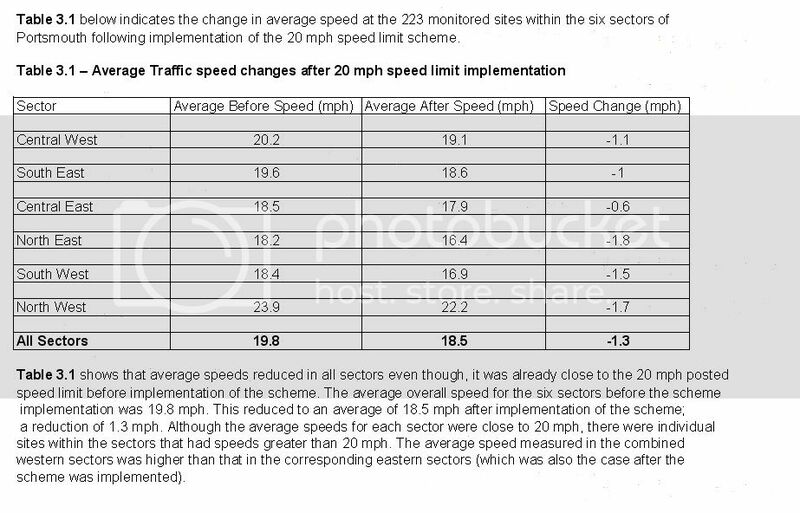 But in their full they show the North West sector of Portsmouth, where average speeds were previously 23.9 mph before implementation the speed only dropped to 22.2 mph after implementation (ie a reduction of 1.7 mph). In the other sectors all roads were already avereraging speeds of less that 20 before implementation anyway. It seems to have been a heck of a lot of money to spend for such small reductions in speeds. Where does this 7mph reduction come from that you mention Rod or was that in Warrington trials ? Rod. You're being disingenuous because I've read the reports including the conclusions from the council that the benefits you seem so certain of are in fact far from certain. The pilots did not reduce casualties. They did reduce speeds but they were beginning to go back up. They did divert large numbers of vehicles onto other roads. The police did express concerns about enforcement and drivers acting aggressively when faced with what they considered inappropriate speeds. I also know that the DFT believes that reducing speeds will increase pollution and that the 20mph limit does not reduce speeds in and of itself. It needs to be enforced with other measures. So no changes to casualties in the Warrington pilots. No significant reduction in speed. Increased pollution. The creation of rat runs. All of the things, in fact, that have been reported from other councils. To be honest I wish you would now give up on making these claims and admit that this is solely about social engineering. I may even agree with you to some degree on that because I actually have more experience than you of living in a city with a fully integrated system of bike lanes, roads and public transport. I studied at University in Muenster in North Germany for two years where they have an incredible network that fully integrates all modes of transport. It was great but wouldn't be achievable in Warrington without flattening the place first and starting from scratch. It is my opinion that your campaign group has helped to cost this town hundreds of thousands of pounds it can ill afford on a scheme with no clear objectives and - at best - extremely questionable grounds for implementation. Based on the results of the council's own pilots, the only reason for this going ahead seems to be a dogma. The last thing we need is to reverse the decision now because that would just further deplete resources, but you have essentially diverted time and money away from more important and meaningful issues. Have WBC had to pay for these prime time adverts where they say '20mph coming to Great Sankey' and the likes or do they get them for free? Today's was '20mph is coming to Orford'. No doubt the sort of div that already tears around the streets of Orford and Great Sankey with no care for anybody else will now limit his speed thanks to these ads. We Cleo it may well reduce the speed of the divs and if it does then it’s not a total waste. My reasoning for that stems from some measurements that I carried out independently on a reasonably long stretch of residential road. I covertly measured the maximum speed of each car over a two hour period and found it to average just 24 mph. To my way of thinking, this proves the vast majority of drivers already regulate their speed according to the conditions. The maximum speed I recorded was by a woman in a four by four who as I recall clocked 37mph on two separate occasions. Now 37mph is a lot faster than most but it’s only 7mph over. Bringing the limit down to 20 would mean that Mrs Div would be driving at nearly double the limit and that’s got to have some effect. I think the stats showing such a small decease isn’t surprising given that most are already driving responsibly and the reduction will be down to the Mrs Divs plus the few people who never do anything wrong. That figure of 24mph seems to be fairly consistent with the DFT's own data and reported average speeds in places like York. That is the reason why these 20mph zones make no difference - because most people drive courteously and with respect to their surroundings and conditions and with concern for the safety of other people. However divs will be divs if you set the speed limit at walking speed. It's always struck me that this campaign has from the start been about cyclist lobbying groups deciding what's best for people, an anti-car rhetoric and getting councillors to buy into the dogma. There seems to be this perception for people like Rod King that anybody who doesn't want to go along with exactly what he wants has to be portrayed as some swivel-eyed petrol-head clarksonesque murderous psychopath who doesn't care how many children and cyclists he mows down. The reality is somewhat different. That’s true but reality takes second place when a child’s life is used to back up an argument and local councillors could never be seen to be not supporting such measures even when all the arguments are so marginal. I’m broadly in favour of the changes provided the main commuting routes aren’t affected but it annoys me to think that as a responsible driver, the changes will mean that I’ll probably be breaking the law now for much of the time. What it will do as you suggest is potentially criminalise the majority of people who are not a problem in the first place because they are driving well below the current limit when conditions dictate but leave the ones who couldn't care less what the speed limit is in the exact same position. My reasoning for that stems from some measurements that I carried out independently on a reasonably long stretch of residential road. I covertly measured the maximum speed of each car over a two hour period and found it to average just 24 mph. How on earth did you manage to measure the speeds ?? The same way as the police do but I didn't stand there with a high viz vest. So how do 'independents' get hold of one of these speed measuring devices like you did Bill ? I'd like to borrow one for a week... or even a day please. Did you have to have any training to use it and was it free ? You need about as much training as you do to use a tape measure You just point and squeeze and the speed reading is displayed on a digital display. I bought the thing from the USA and seem to remember it costing about £70. It's probably not legal here in the UK but what the heck it told me what I need to know and nobody was hurt in the process. I have offered to lend it to you in the past but you never took me up. Did you Appologies for that Bill as I don't remember that. I may well take you up on your offer (if it is still available of course) but if your machine is possibly not legal then could I use my findings ? Would I be better contacting the police to ask them to monitor the road speeds or to lend me a 'legal' and uk callibrated machine of theirs so I can take some readings which they would take into account ? It would be interesting to see whether I am just homing in on the the speeds of the 'idiot fast' drivers more often rather than the majority who are indeed driving far less tham the 30mph limit and who who slip by me un-noticed. It all depends on what you’re trying to prove because any results you obtain won’t count for anything unless you’re playing by “their rules”. The device is manufactured and licensed for use in the USA rather than the UK, so technically you’ll be breaking the law just by using it because it’s not approved. It uses X band radar and although the universal laws of physics are a constant, they would still argue that the device has not been calibrated since it was manufactured. It’s a simple point and squeeze device, however because you’ve not been officially trained and supervised or have notified the public, any results just won’t be acceptable. Bottom line Diz, is if you want a simple no fuss way of quickly establishing the true facts for yourself then you do it my way. On the other hand if you want the results made public then go down the official line. Going for my beer night at the London Bridge and I've put the speed gun in the car. Give me a call 07876 477155 and I'll drop it round for you. I'll try the cameras accuracy Diz..... I scoot down London Road at a steady 130 whilst on the phone to you and see if it tells you I'm doing 130! !